For the most part, it seems like the only animals that do any real competitive jumping-over-things are horses. Sure, dogs, in agility displays, and humans, in hurdles, sometimes get in on the action, but when you say the words “show jumping,” people tend to think “horses.” But they’re certainly not the only animals that can do it. What do you know about rabbits? They like carrots, make funny little marble poos, have soft, long ears, and, of course, they can hop—so well that a few intrepid human types have harnessed that hopping power for sport and humor. Rabbit jumping started in Sweden in the 1970s with rabbit-owning clubs, which soon turned a weird little pastime into a fun competition; in the beginning, the rules were based on horse jumping rules, but were soon revised to fit a rabbit’s abilities. The Swedish Federation of Rabbit Jumping, the sport’s governing body, was founded in 1994 and since then has organized two championship meets each year. Competitions have four distinct categories—straight course, crooked course, high jump and long jump—which are all exactly what they sound like they’d be. And there’s evidence that rabbit jumping is becoming all the adorable rage: Now, both Finland and Norway have their own federations, while the U.S., Denmark, and the UK all host their own competitions. Cows don’t seem the most nimble of creatures, no matter what the nursery rhyme says. But that didn’t stop Regina Mayer, a German teenager possessing remarkable tenacity. After her parents refused to buy her a horse, Mayer, then 13, started to train a calf on her family dairy farm. It was six months before Luna would let Regina ride her, but eventually, the unconventional pair worked up to jumping low fences; Luna is not the most graceful of jumpers, but she manages to heave her bulk over the fences at an admirable, if bovine, speed. Llamas and alpacas don’t seem like the type to go in for jumping over things at the behest of humans. But llama and alpaca agility displays are increasingly becoming a part of livestock shows, if only for the sheer enjoyment of watching something that looks like an adorable bucktoothed deer-poodle hybrid leap over a fence with a running human by its side. It’s becoming a real thing—in the UK, for example, the Black Rock Llama farm tours agricultural shows with their “super llama” teams, exhibiting their animals' incredible agility skills on courses with jumps as high as three feet. It makes sense: Zebras are basically striped horses (well, smaller, less easy to domesticate, and structurally weaker horses who haven’t had the benefit of thousands of years of domestication). When Zack the zebra’s owner, Sammi Jo Stohler, the Zebra Guru of Willis, Texas, caught him hopping five-foot fences to get out of his paddock, she thought she’d give him a go as a show jumper; he can now be ridden Western and English styles and can tackle fences of nearly three feet. Zack lives on a farm with Charlie, another zebra who has been trained to pull a cart, a zorse (horse-zebra hybrid) who can also pull a cart, and a zonkey (donkey-zebra hybrid) who can be ridden. This is just an excuse to include a video of a cat hopping over a jumps course made out of broom handles and furniture. Because it’s cute and cats and the Internet. Sheep can and do often jump, but they’re not terribly trainable—they’re sheep, after all. That makes Hettie, the fantastic show-jumping sheep, fairly unique. Hettie made news in 2006 after her owners discovered her aptitude for jumping; they’d been taking their Shetland ponies round a jumping course when Hettie sidled up and began jumping the fences along with the ponies. Eventually, Hettie could jump five fences in a row, and was working on clearing even higher fences. And though she may not have started a fad among sheep farmers for training their sheep to show jump, Hettie did inspire several terrible, pun-erific headlines involving the words “woolly jumper” (get it? Because a “jumper” is a sweater… and they’re made of wool…). And we say fairly unique – because in 2013, Lavender the Ram’s ability to leap fences nearly three feet in height both saved him from the butcher’s block and earned him the title “wooly jumper” in The Daily Mail and other British tabloids. 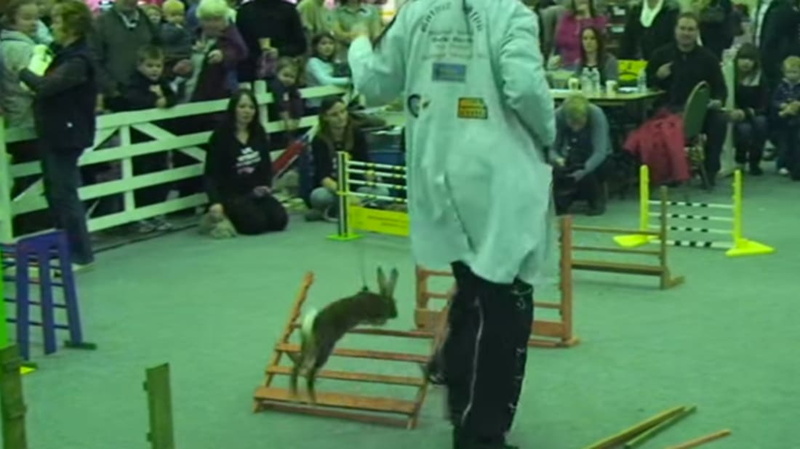 So, this isn’t animals jumping over obstacles—it's people jumping over animals. Seems somehow kinder, really. Plus, it’s unbelievable. It’s a rite of passage among the young men of the Zaraniq tribe on the west coast of Yemen to take a running jump at a row of six foot camels and sail amazingly, incredibly, over them.